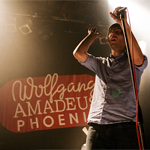 What: French electro-pop outfit who became international superstars on the back of 2009’s Wolfgang Amadeus Phoenix and have graduated to headlining festivals and playing very big rooms. Why: The long-awaited follow-up to Wolfgang finally arrives on April 23, and advance word on Bankrupt! is that it sounds very much like Phoenix, which should be a relief to all. Phoenix is not necessarily a band that people want massive artistic growth from – they want hooks, hooks, and more hooks. And Bankrupt! has hooks. Where: The Queen Elizabeth Theatre in Vancouver. That’s right, it’s a contest for the west coast – don’t you guys out there say I never do anything for you even though, really, I don’t. Who else: Montreal’s Mac Demarco will warm things up. How: Tickets for the show range from $45 to $70 in advance but courtesy of Universal Music Canada, I’ve got one pair of passes to give away for the show. To enter, email me at contests AT chromewaves.net with “I want to see Phoenix in Vancouver” in the subject line and your full name in the body, and have that to me by midnight (Vancouver time), March 21. What else: Spin has details on what sorts of bonuses come with the deluxe edition of Bankrupt! What an amazing contest! Phoenix really blew up! Kudos to a great band! great contest. Wish I lived in Canada!